McCormack earned the individual victory in the men’s race at the Clemson Invitational on Friday at Musser Farms. 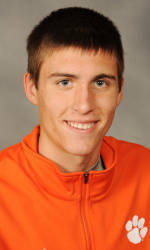 McCormack led almost wire-to-wire in dominant fashion over the men’s 8,000-meter race. The native of Gainesville, GA easily lowered his personal best to a time of 23:56.72. He finished 10 seconds ahead of his closest competitor, Ryan Hopkins of Davidson.